when i open the game, mouse pointer do not show, i need to found where mouse is when it´s over a link and change color... someone know to fix that? Come on, do you want to bury this game once and for all? Whenever i click on the "newest levels" and "show previews", my game crashes. Actually, i cant play new levels AT ALL. Just tried to. Right after i select one of the levels, the game crashes. So, I bought the permanent license key a few years ago and played a lot. I took a break from Tricky Truck for a while, but now I'm back! The problem I'm having is, I've forgotten my code to put in Tricky Truck! It auto-fills it in, but doesn't tell me what the actual code is. Any help from any admins or other people of high authority would be greatly appreciated! Thanks! I have been thinking for a long time it would be fun to make TT into a console game that could be taken to various places, such as Burning Man or gaming conventions, so it's like you're sitting in a truck (you could make it out of a real truck cab) with a big screen for windshield, and sensors in the gas and brake pedals and steering wheel to give you controls that feel and work as you expect, and even put the rear view mirror screens in the side rear view mirrors (can you actually drive three screens at once with TT)? You could mod shifter and turn signal shafts to be controllers for the console like which game you are going to play and which truck to play. I think the steering might need some kind of intelligent mapping from angle of turn into frequency of tapping the steering keys on a keyboard. This time I bring you a re-upload of something I created a few years ago for TT called the TT Level Modder. Its exactly what it sounds like, its a tool to mod .trk files. 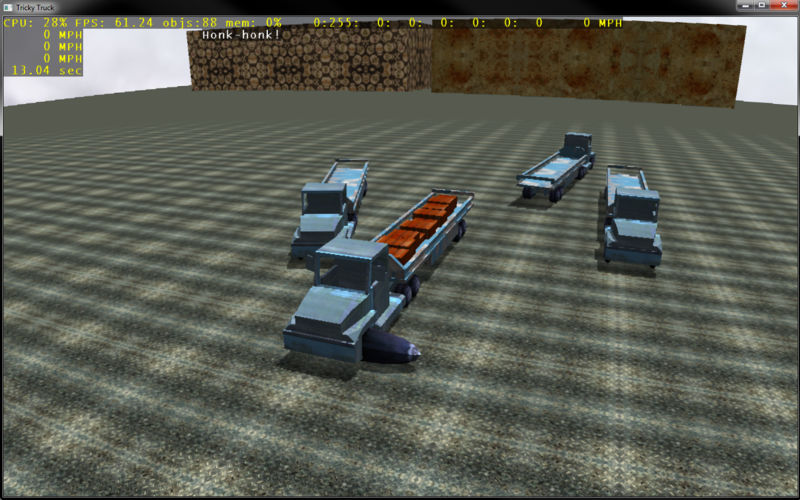 Or maybe you've wanted to resize the wheels of the truck, thats possible too and gives funny results. All $$$ features require a license, however those with a license don't need to enable $$$ in a level to use these features.